For lovers around the world, Valentine’s Day is a giddy time to celebrate shared love with hearts and flowers, candy and candle-lit dinners. But what about those of us who are love-less? The ones who lost love, were betrayed in love, or for whom love never even bothered to show up. You know, the kind of love stories that leave a bitter taste in your mouth. What do we celebrate when everyone wears their hearts on their sleeves this Valentine’s Day? We celebrate bittersweet love. That once-possessed, been-there-done-that love story that is no longer and it’s alright. We may be in between lovers or just ok with being happily single, because we can turn lost love’s bittersweet taste into delicious satisfaction. For that reason I created my Bittersweet Love Salad. They say it’s better to have loved and lost than never to have loved at all. True, though it can be hard to believe when you are in the throes of a breakup, estrangement, or divorce. That’s exactly what happened to me a decade ago. I was fresh out of a marriage-gone-wrong and not feeling very excited about the looming V-Day. But, I was designing a menu and recipes for my Valentine’s cooking class and needed inspiration. After overdosing on all the sticky romantic sweetness of classic dishes, I was about to give up. My heart just wasn’t in it—my heart was broken. I was feeling angry and reluctant to celebrate love—bitter and mad at stupid-cupid for getting me into this mess. Then it hit me—I could create a dish that honored the downside of love. 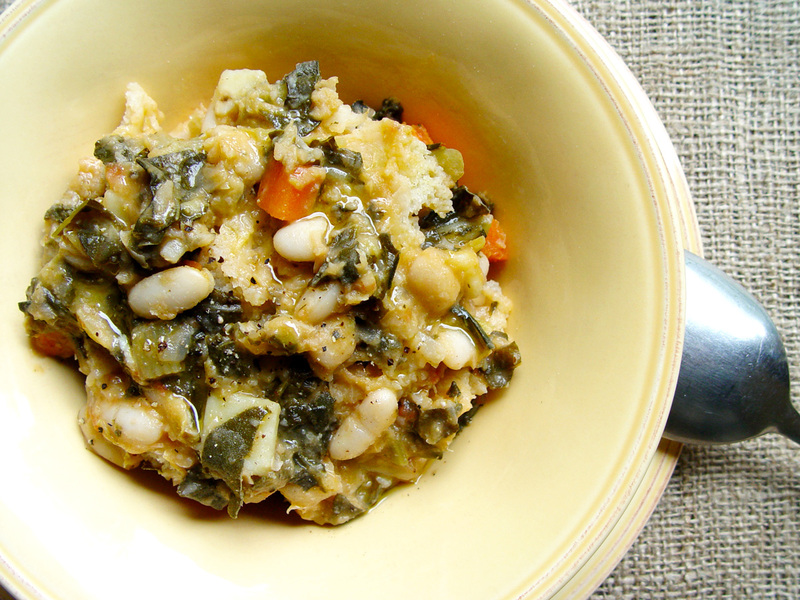 The edgy, other-side-of-amore with lots of flavor and emotion. This could be fun! I set out to choose my ingredients with care—and a pinch of revenge, a dash of malice—but all in the name of good fun and good food. The first thing I chose were some bitter lettuces to pair with sweeter flavors. My first choice was arugula, the beloved spicy green that’s delicate but also asserts its personality in any situation. While thought of as a leafy green, arugula is actually from the brassica family (cabbage, broccoli, cauliflower) and helps detoxify the body. Its peppery flavor has a natural cooling effect that will work to cool off my temper, I thought. 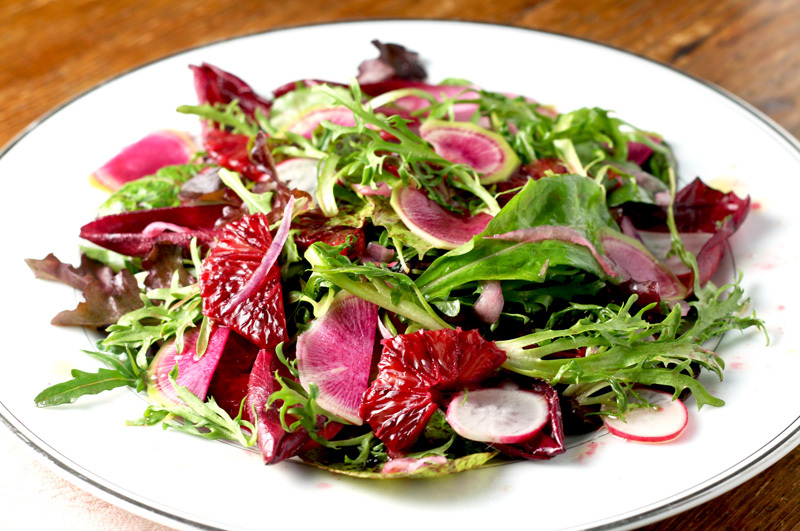 I mixed the arugula with some milder speckled and red leaf lettuces and a little frisée—a curly member of the chicory family with a delicious bitter edge. Bitterness can actually be good medicine since studies have shown that bitter-is-better for health and wellbeing. I also added some lovely spears of red endive for more color and bitter sweetness. I was seeing red, so it was only natural that I added Blood Oranges to the salad as a no-brainer during February citrus season—and since their vibrant crimson, almost blood-red flesh draws red juice when cut. These juices were running deep—and right into the salad dressing to turn it a beautiful ruby hue. 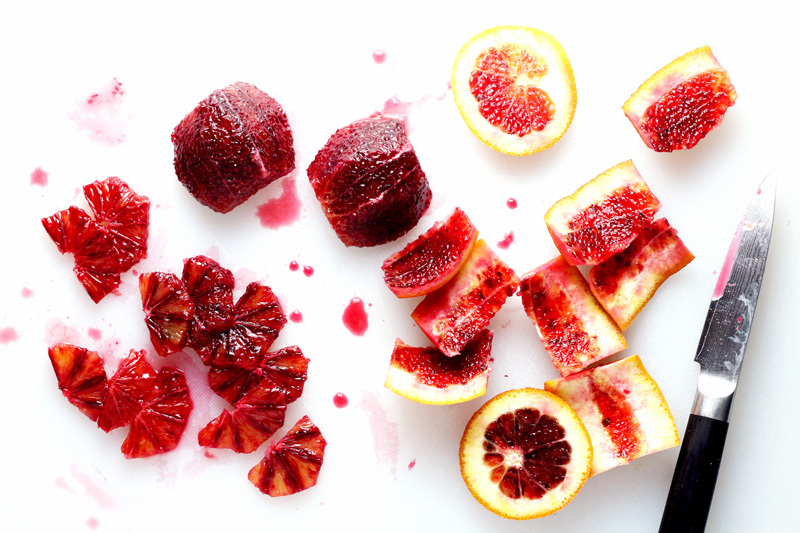 Blood oranges hail from Sicily and are prized citrus fruit with a red-blushed rind and tart sweetness unlike any other fruit. 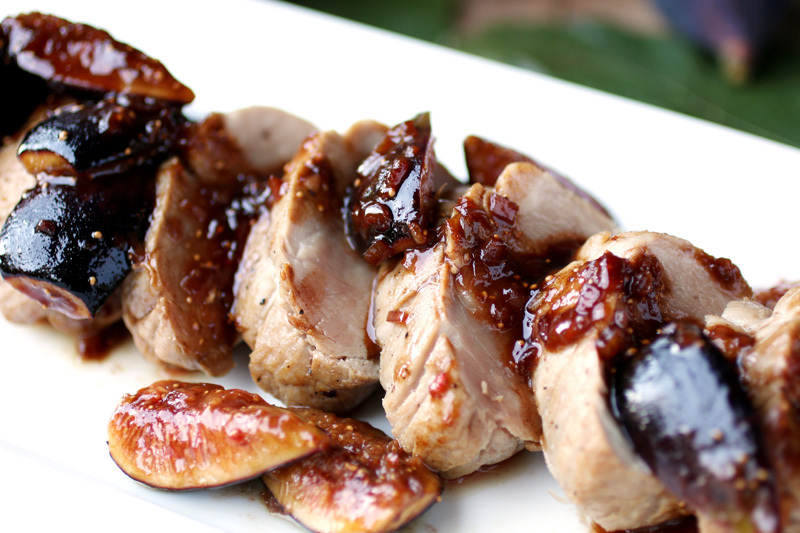 They have an intense aroma and tangy dolcezza with hints of raspberry, which I happily enhanced with raspberry balsamic vinegar in the dressing. The abundant vitamins and minerals in blood oranges may not heal a broken heart, but they will keep it beating and healthy for the next love story! I also gleefully added thin slices of red onion to the salad for an appropriate amount of vengeful bite, and shaved radishes for a riotous, kick-in-the-pants punch that I wish I’d given my ex. 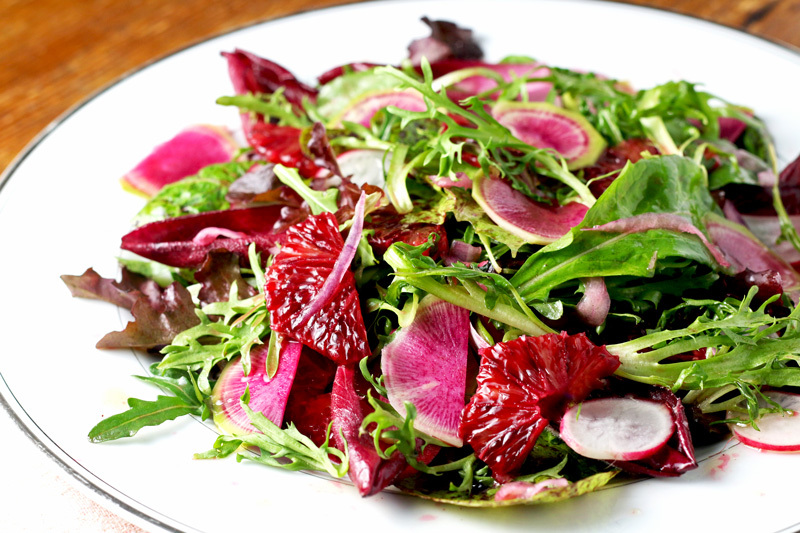 All in all, it’s not only a bright, colorful salad perfect for Valentine’s Day, but a flavor-forward, match-made-in-heaven mix of bitter, sweet, and spicy ingredients for an uplifting dish all winter long. Now, instead of eating your heart out, you can eat my beautiful Bittersweet Love Salad. I guarantee that the lingering taste of love in your mouth will not be bitter. 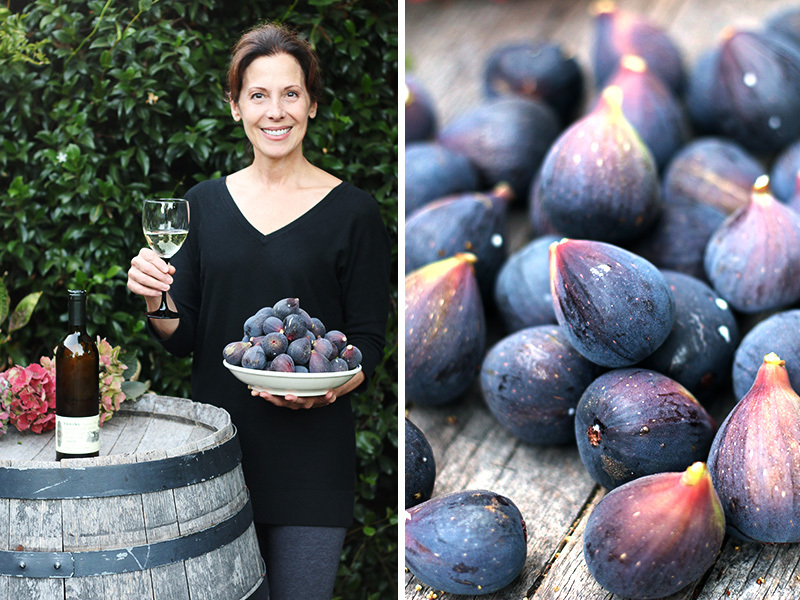 It will be a delicious, bittersweet flavor to savor loves past and loves future—or maybe just the love of bitter greens and fruit ; ) Love yourself today and Happy Valentine’s Day to all! 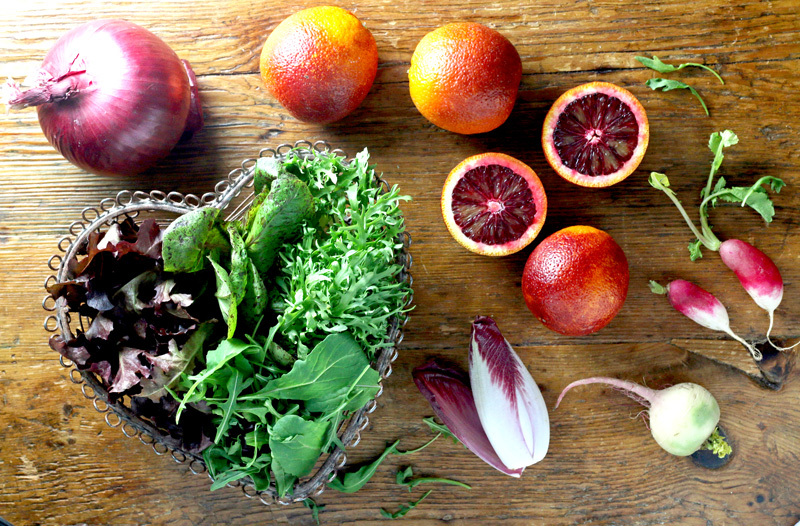 My Valentine’s Day salad celebrates long-lost love and bittersweet memories with a riotous mix of tangy blood oranges, peppery arugula, red onion, and spicy radishes. Never has bitterness tasted so good! © 2019 Deborah Dal Fovo. All rights reserved. Supreme each orange in the following manner: using a sharp paring knife, cut about 3/8-inch off the top and bottom of each orange, reserving ends. Set an orange with a flat side down on the cutting board. Starting at the top of the orange, position the blade of the knife in between the orange flesh and ring of white pith inside the rind. Slice downward to the base of the orange, curving the knife around the fruit to cleanly cut off the pith/rind in a single vertical strip. Turn the orange slightly and repeat the motion in strips around the fruit until the rind and all white pith is removed. Repeat procedure on other orange. Cut out the orange segments by slicing in between the thin membrane walls surrounding each one to release the fruit. Alternatively, you can cut the orange in half down the middle then into thin, half-moon slices. Arrange the orange segments/slices in a single layer on a plate and season lightly with salt to bring out the natural sweetness of the fruit. Scrape orange juice accumulated on the board into a small bowl. Squeeze the juice from the reserved orange rinds into the bowl and set aside. Trim ½-inch off the stem end of the endive then separate the leaves and place them in a large mixing bowl. 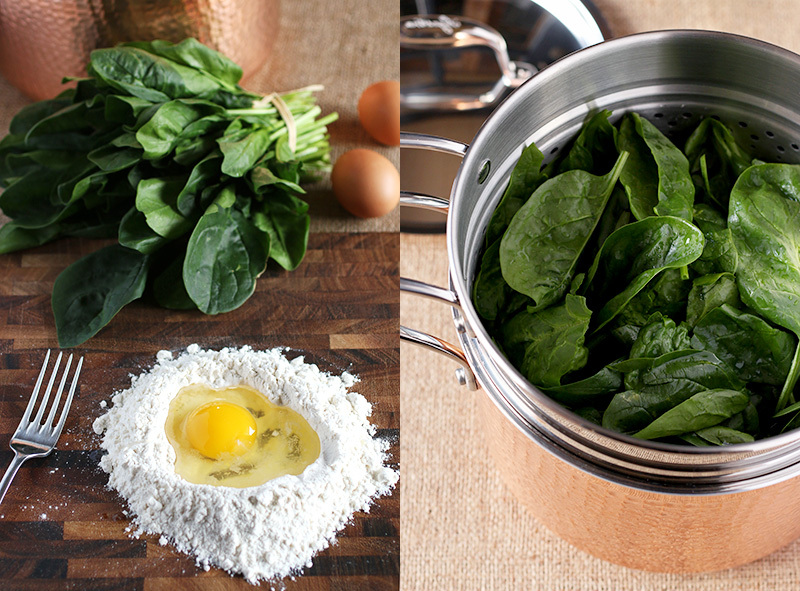 Add the arugula (and other lettuces, if using) to the bowl. Cut the red onion thinly into fine strips. Slice the radishes into very thin rounds using a sharp knife or mandolin. Add the onions and radishes to the lettuce in the bowl. Make the salad dressing by seasoning the blood orange juice in the small bowl generously with salt and pepper. Add the vinegar and whisk to dissolve salt. Pour in the olive oil in a thin stream while whisking to create a light emulsion. Taste and adjust seasoning if needed. Sprinkle the ingredients in the salad bowl lightly with salt and pepper and toss together delicately using your hands. Add the orange segments to the bowl then pour the dressing around the edges of the bowl (not on the lettuce). 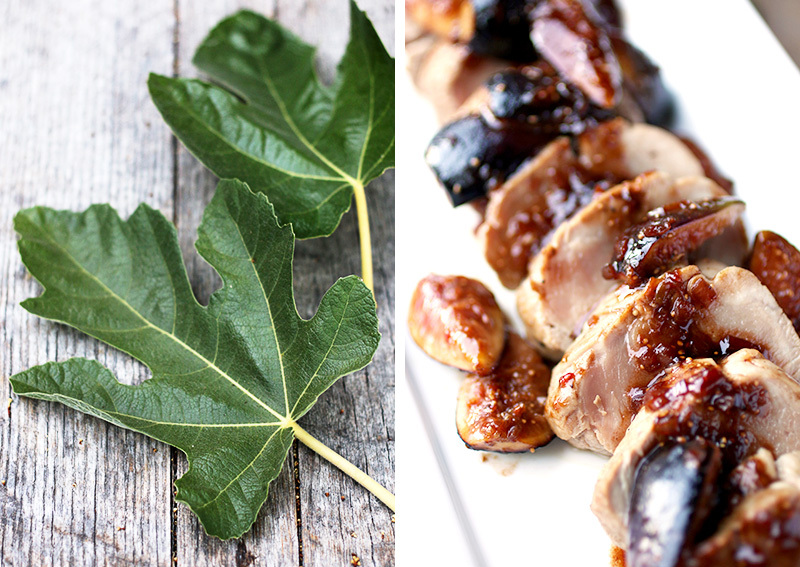 Toss the ingredients together quickly with your hands to lightly coat with dressing. 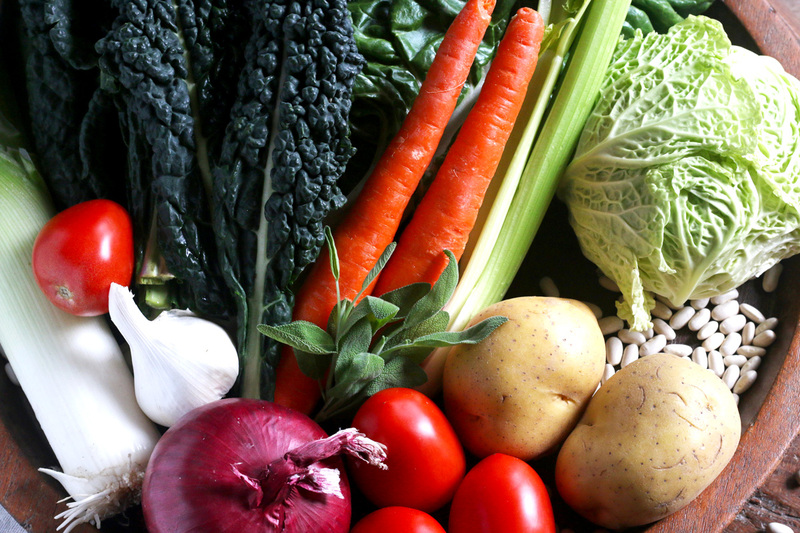 Lift portions of salad out of the bowl and mound on individual plates, arranging oranges and radishes decoratively. Serve immediately. How do I love thee? Let me count the ravioli. Seriously, there’s no better way to say “I love you” than with a plate of handmade pasta lovingly crafted and offered as a token of your affection. After all, you put a little bit of yourself into every bite by kneading, rolling and shaping the pasta even before it is cooked. The act in itself is a delicious labor of love. Then why not take it to the next level with colored pasta and make a real statement? 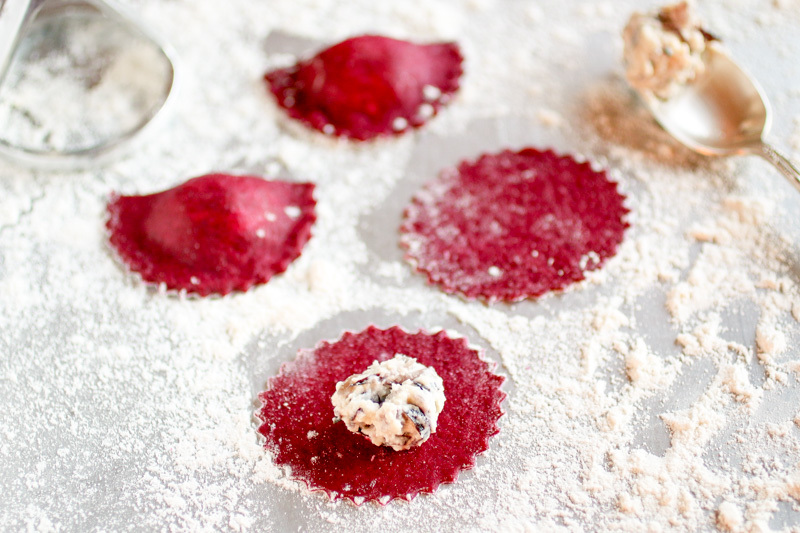 Those were my thoughts last year when I created these Beet Pasta Ravioli with Ricotta and Radicchio Filling for Valentine’s Day. 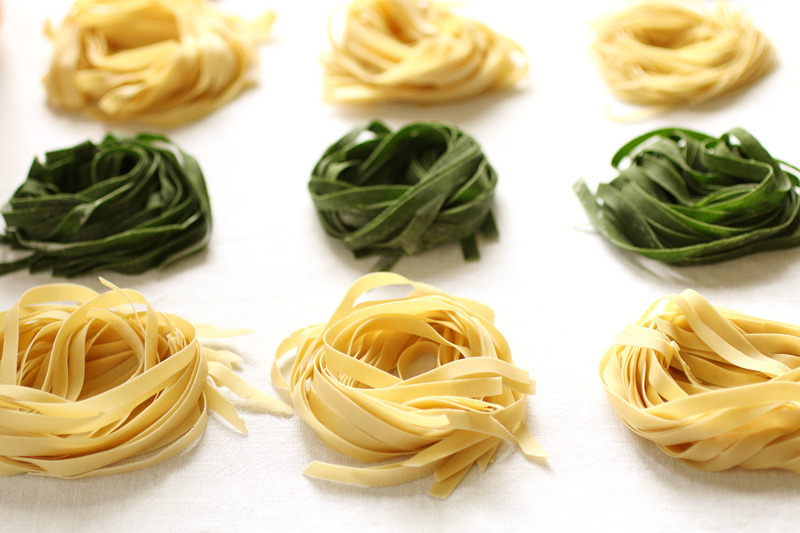 Yes, I make other colored pasta, like these green tagliatelle colored with spinach that I did here. 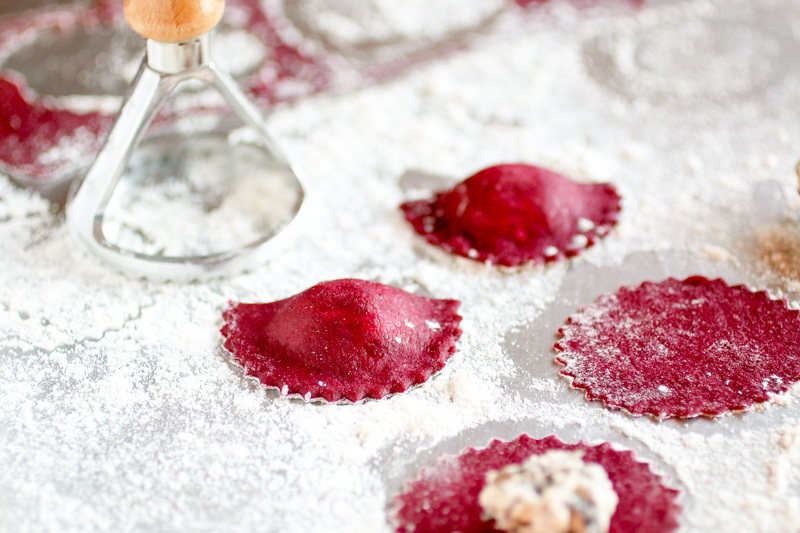 But these Valentine’s ravioli were begging to be red—really, really red—the color of love, of passion, of beets. 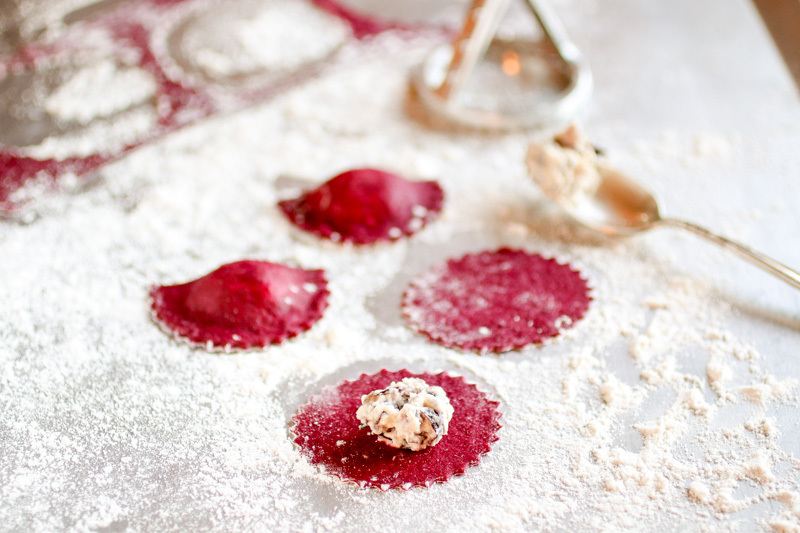 In fact, for these ravioli the pasta dough is stained deep magenta-red with beets before it lovingly envelopes a creamy ricotta and radicchio filling to form pretty half-moon shaped ravioli. 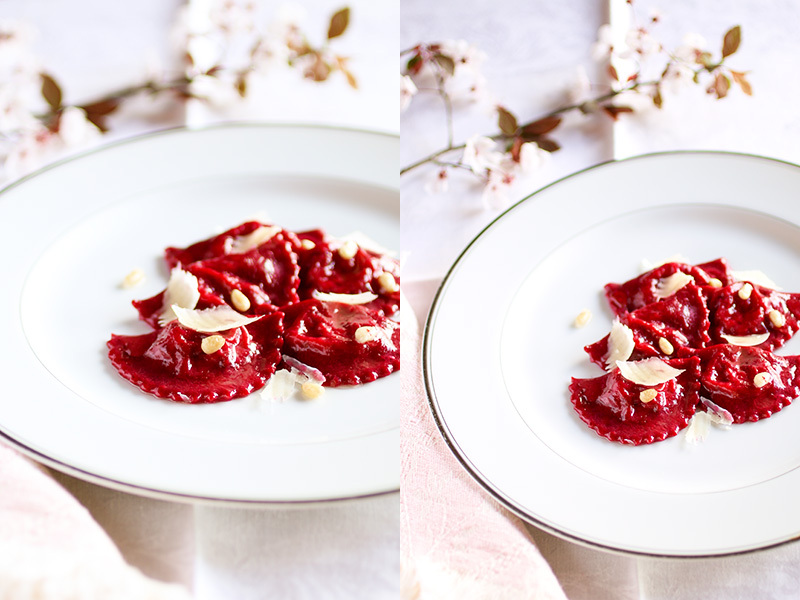 They look stunning on the plate, dressed in a rosy sauce of beet-tinted melted butter and scattered with toasted pine nuts and delicate wisps of shaved Parmigiano. 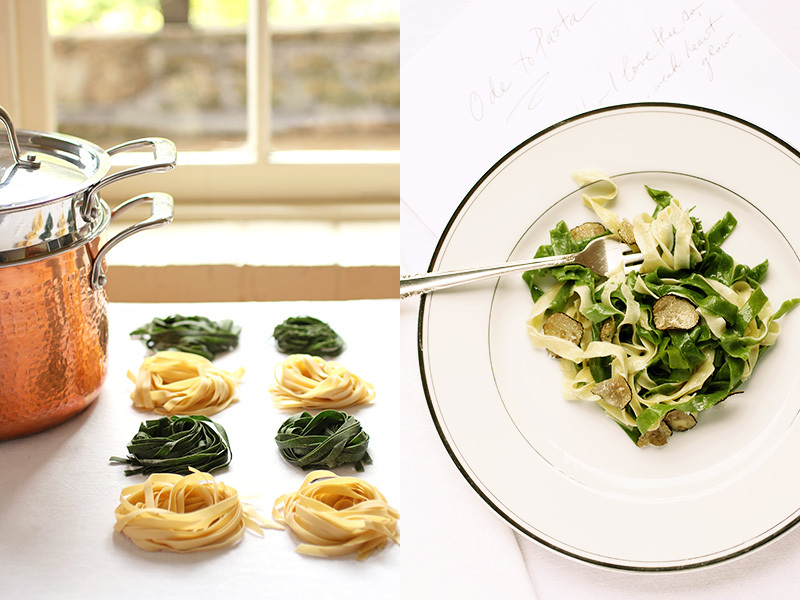 A romantic meal never looked or tasted so good! It took a little love on my part to get this beet pasta recipe the way I wanted it. You see, beets stain but they also bleed. That means when red pasta cooks, the color can leach into the boiling water and fade —taking the pasta from bright magenta to drab pink. But that wasn’t good enough for me and I was determined to get an intense red pasta that held up to cooking. And I did…here’s how. I use more beets than most but it works because of a few tricks I’ll share with you. First, I roast the beets so they don’t get watery like they can if you boil them. Then I puree the beets using a fine blade in my food mill, but you can also process in a food processor. Next—and most importantly—I squeeze all the liquid out of the beet puree (saving it for the sauce) in a cotton napkin I don’t mind staining until it’s dry like play dough. 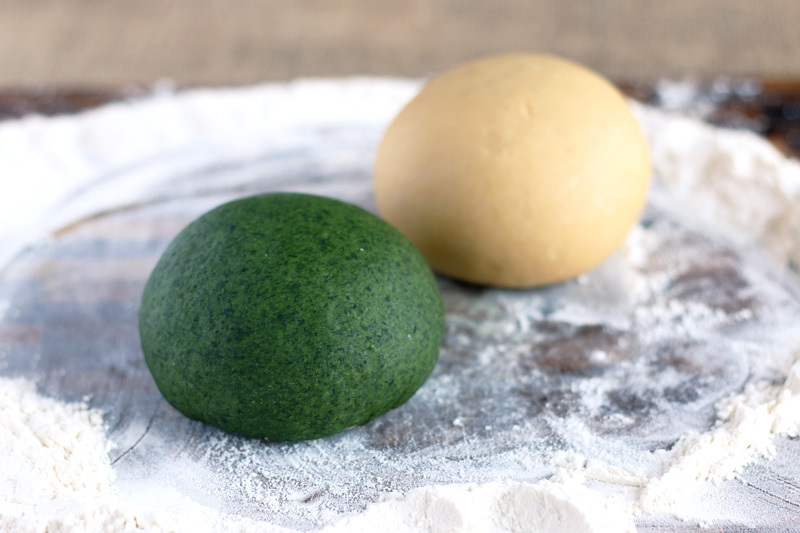 This creates a concentrated pigmentation agent to add to the egg before incorporating flour, so less flour is needed and the pasta dough is darker. After kneading the dough until smooth and soft, it is dark magenta and almost purplish in color. But don’t worry because some of the color will fade during boiling and the cooked ravioli will be a lovely shade of red. You should know that while red beets color pasta dough beautifully, they can stain your hands and counter tops if you’re not careful. To avoid this, I work on washable cutting boards and wear disposable latex gloves when making the pasta dough. 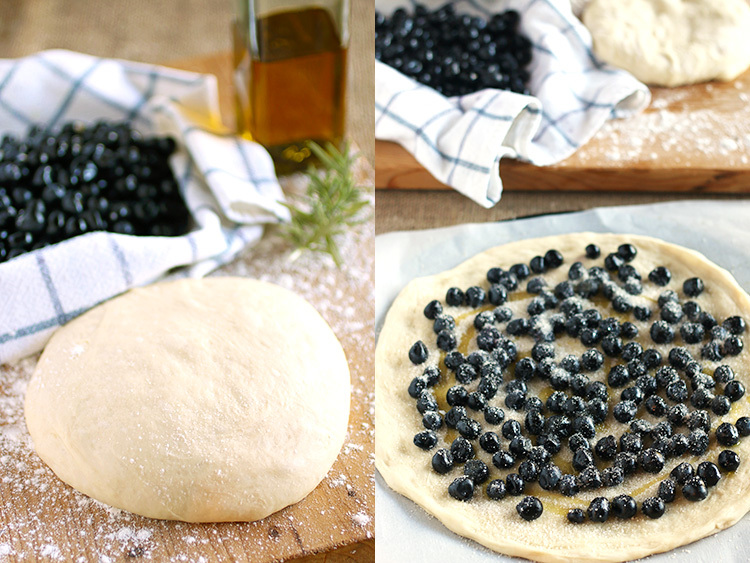 Once the dough is made, roll it thin—either with a rolling pin or using a pasta machine. Cut the pasta sheet into circles, dab each with a spoonful of ricotta and radicchio filling, then fold and seal the edges well to form half moon shaped ravioli. 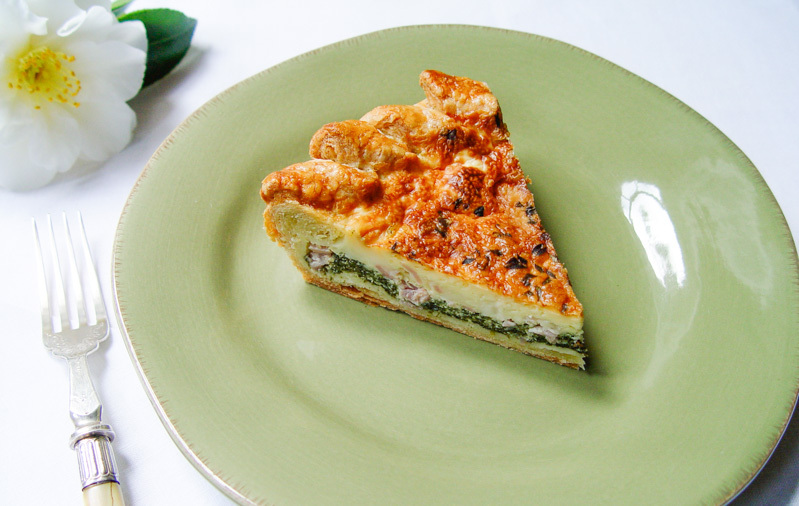 This filling comes together quickly with a mixture of ricotta cheese, egg, Parmigiano and caramelized radicchio. Radicchio is red chicory with a bittersweet peppery flavor that adds spice to the mild ricotta and compliments the beet infused pasta. I like to use Treviso radicchio, but if you can’t find it, the Chioggia variety works well too. 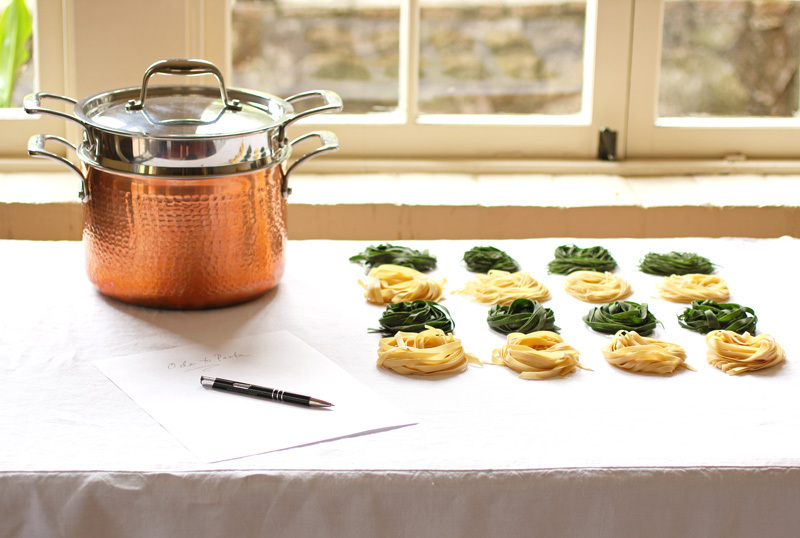 Once the ravioli are made the work is done leaving plenty of time to get dressed and light the candles on the table. Then, just a few minutes before serving, the pasta cooks while a quick yet sumptuous sauce is made from reserved beet juice and butter to toss the ravioli in and coat them with even more color and flavor. 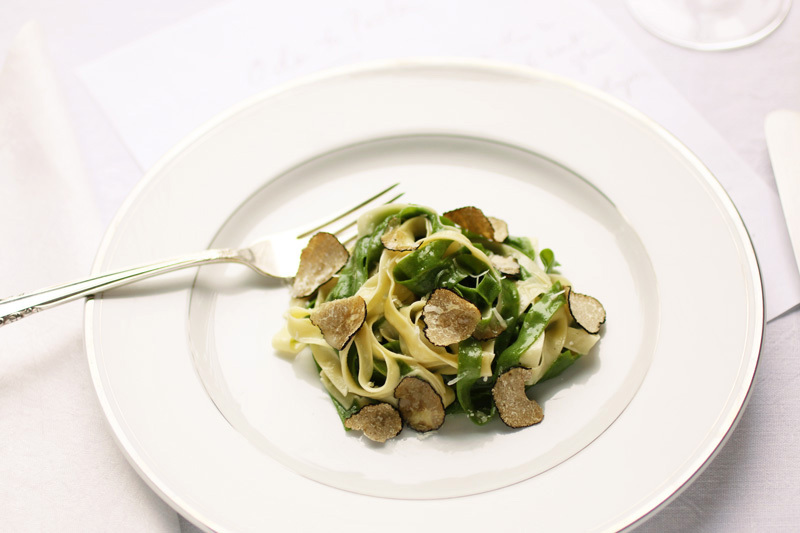 Arranged on plates with a smattering of toasted pine nuts and Parmigiano shavings over top, they make quite an entrance and are sure to set the mood for your romantic meal. Happy Valentine’s Day…or should I say…beet mine? 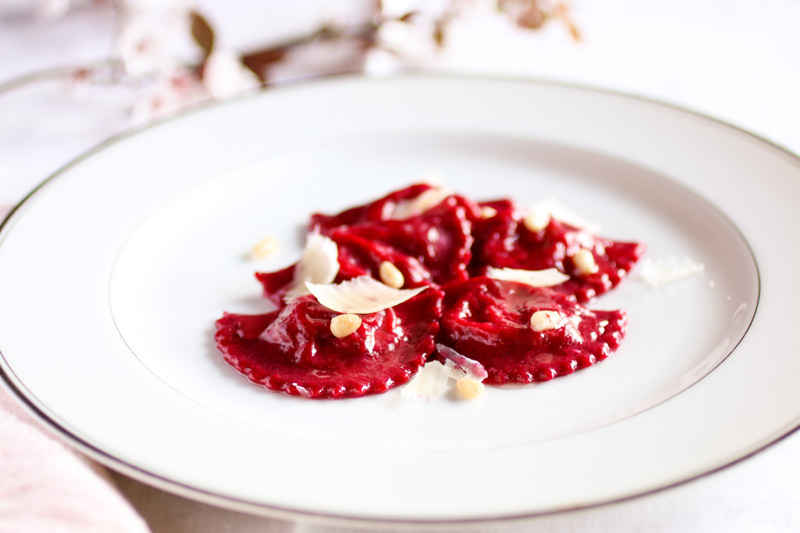 The pasta for these half-moon shaped ravioli is tinted deep magenta red by pureed beets then filled with creamy ricotta and caramelized radicchio. 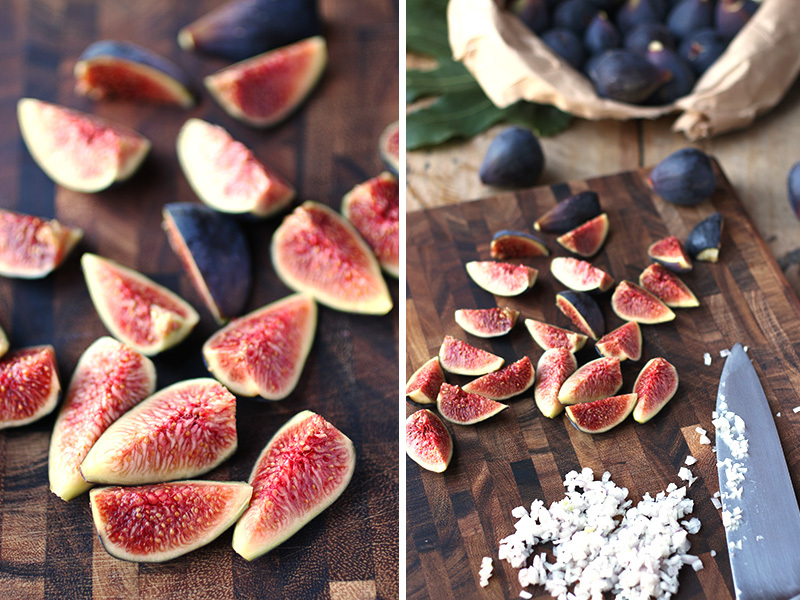 They look stunning arranged on a plate dressed in rosy beet-infused melted butter and scattered with toasted pine nuts and Parmigiano shavings. © 2016 Deborah Dal Fovo. All rights reserved. NOTE: When working with red beets, wear disposable latex gloves and use cutting boards and glass bowls to avoid staining skin and work surfaces. Wash the beets well under cold water then place in center of a sheet of aluminum foil. Drizzle with olive oil and season with salt and pepper. Wrap the foil over the beets and crimp ends together to form a leak-proof packet then set on a baking sheet. Bake for 45 to 55 minutes until beets are tender when pierced with the point of a knife then remove from oven and cool. Peel the beets, cut into pieces and puree through a food mill or in a food processor until smooth. Place the beet pulp in the center of a clean, cotton napkin (that you don’t mind staining) and squeeze out all excess liquid into a bowl (about ¼ cup) until the pulp is dry like play dough. Set beet juice aside for later use. 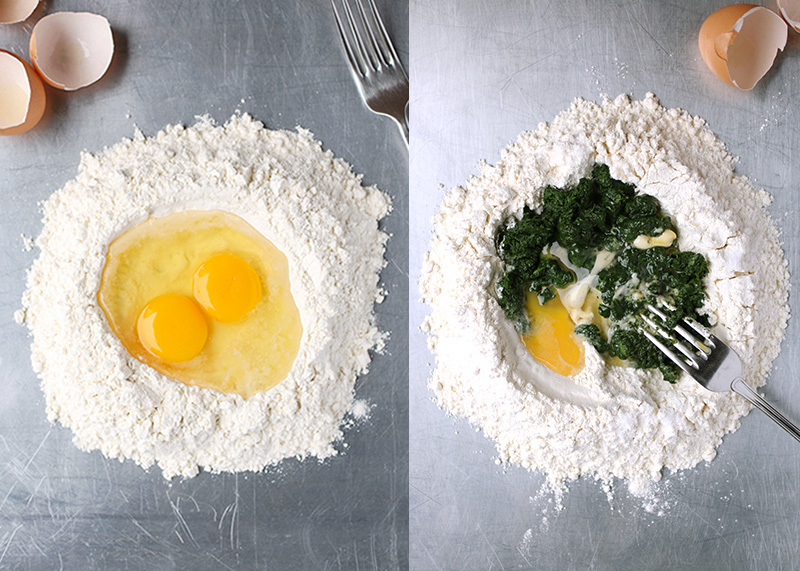 To make pasta dough, mound the flour on a cutting board (or in bowl) and form a well in the center. Place the egg yolk, beet pulp and 1/4 teaspoon salt in the well and beat with a fork, gradually dragging in the flour, a little at a time, until a crumbly mass forms. Gather the dough into a ball with your hands and knead on a floured board for 6 to 8 minutes until soft and smooth, adding more flour as needed if sticky. Form dough into a ball then wrap tightly in plastic wrap and set aside to rest. 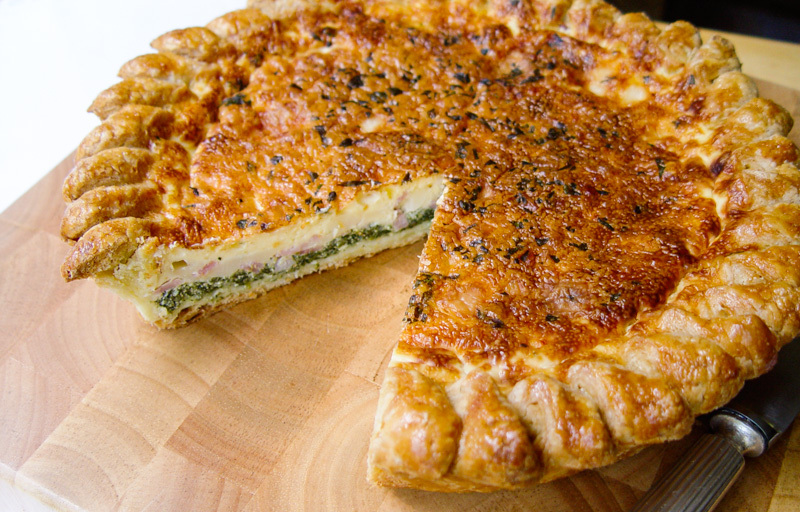 For the filling, place olive oil, butter, and shallots with 1 tablespoon water in a skillet over medium heat. Sprinkle lightly with salt and cook until shallots are soft and moisture has evaporated, 2 to 3 minutes. Add the radicchio, season with salt and pepper and cook until wilted and lightly caramelized, stirring, about 4 minutes. Remove from heat and cool. Mix the ricotta, egg yolk and grated cheese together in a bowl until smooth then add the radicchio and stir to combine. Taste and adjust seasoning if needed. Divide the pasta dough into quarters and work with one piece at a time (keeping the rest wrapped in plastic until needed). 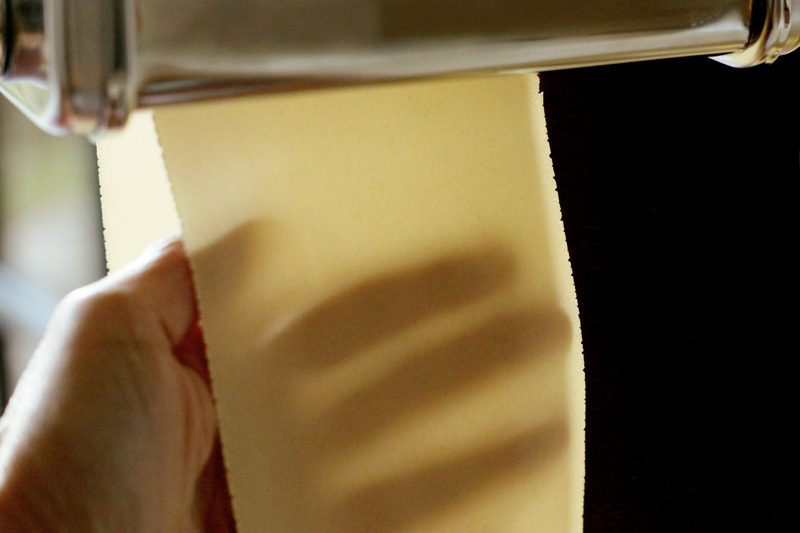 Using a pasta machine or rolling pin on floured surface, roll the dough into a thin sheet about 1mm thick (you should see your hand in transparency through the pasta). 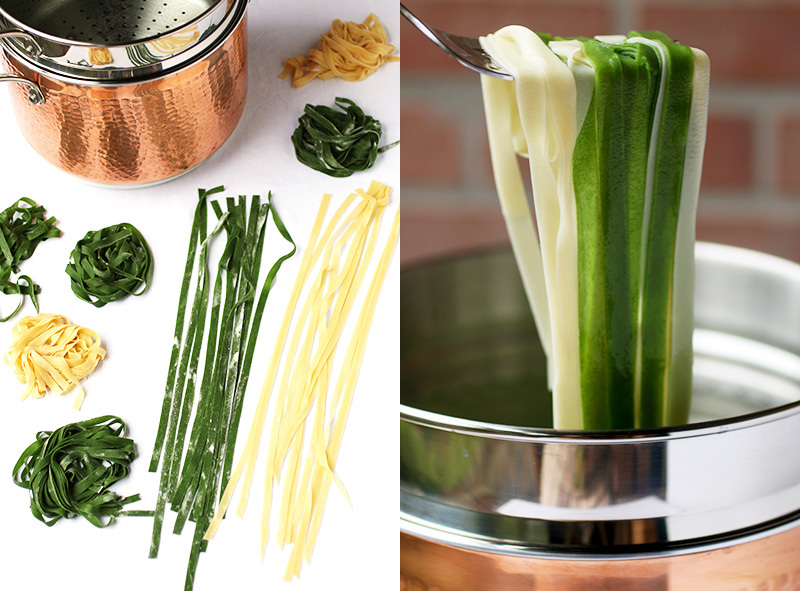 If using a pasta machine, pass the dough repeatedly through the rollers increasing the setting each time to reduce roller thickness and thin dough. Bring a large pot of water to a boil over high heat then add a generous handful of kosher or sea salt. When the water returns to a boil, add the ravioli and stir gently to prevent sticking. Cook the ravioli until ‘al dente’, tender yet firm to bite, 2 to 3 minutes. While the ravioli cook, boil the reserved beet juice in a large skillet over medium-high heat until thick. Add the butter and melt, stirring to create a smooth sauce. Scoop the ravioli from water using a slotted spoon and place in the sauce. Toss ravioli in the sauce over heat for less than a minute until well coated, adding a little pasta cooking water if needed. Arrange six ravioli on each plate and drizzle with sauce. Scatter toasted pine nuts over top and sprinkle with cheese shavings. Serve immediately. It’s often said that patience is a virtue and good things come to those who wait. This is especially true when it comes to Hachiya persimmons, an obscure and misunderstood winter fruit known as kaki to the Japanese and cachi to Italians. 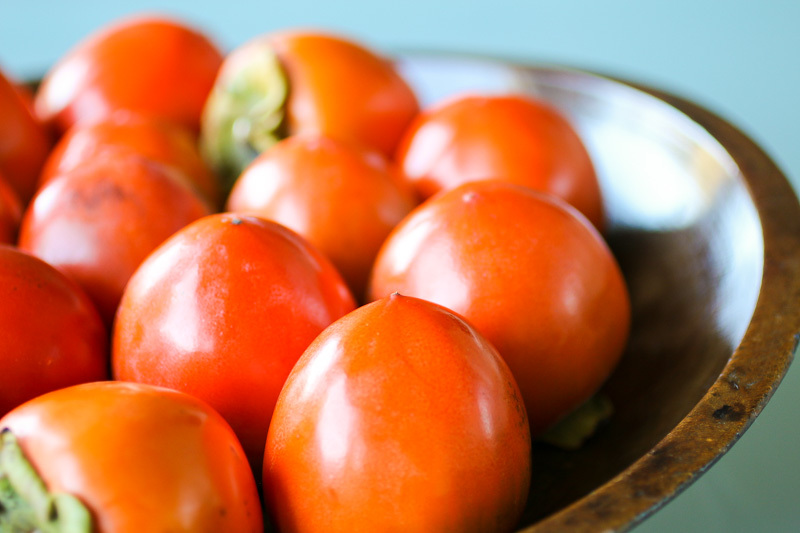 These persimmons are often confused with the flatter Fuyu variety that is eaten firm like an apple early in the season. But Hachiya persimmons—whose inviting shiny orange, pointed forms make them tempting to enjoy when they are young—must mature and soften for weeks on end before they are edible. It makes January the perfect month to make this Persimmon and Pecan Bread when fruit that has been slowly ripening on the window sill is very soft and ready for use. Hachiya persimmon’s delicate sweetness and alluring fragrance give this simple bread an air of aristocracy that makes it ideal for afternoon tea or a luxurious breakfast in bed…and well worth waiting for. 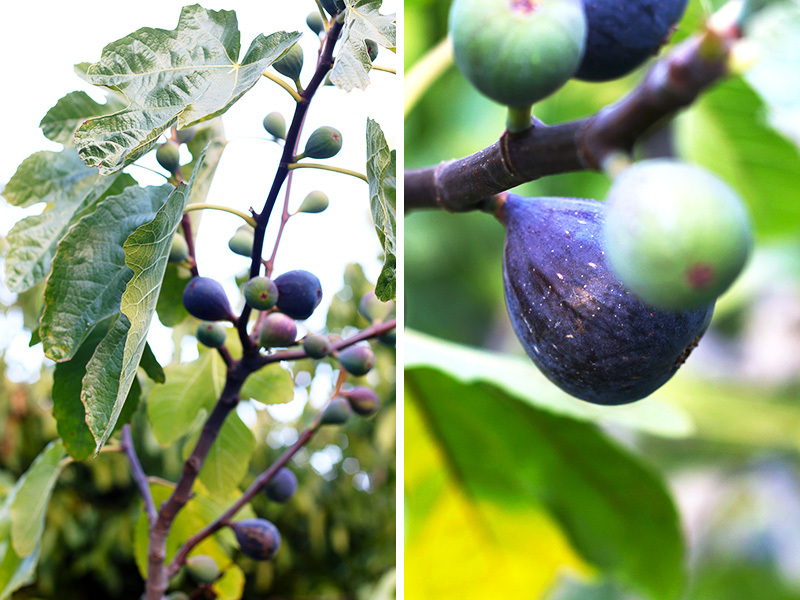 A seasonal fruit with oriental origins, Hachiya persimmons first appear on leafy trees in late autumn. But their beauty is not fully evident until winter when the tree sheds its leaves to reveal bare branches hung with brightly colored, heart-shaped fruit—making it look like a timely Charlie Brown Christmas tree strung with shiny ornaments. 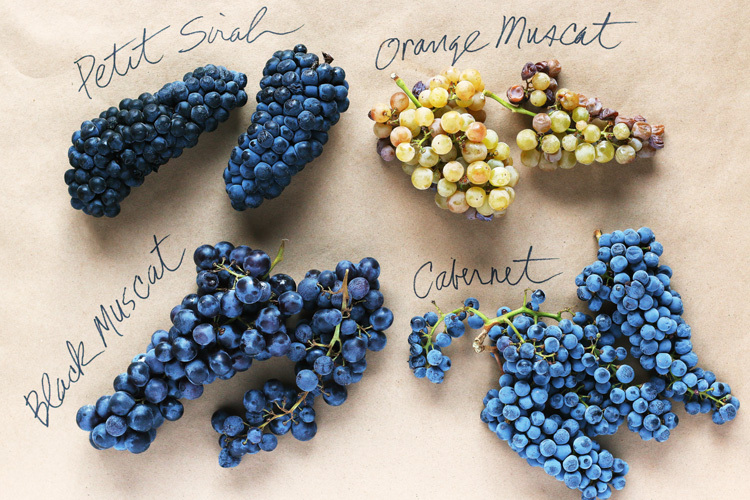 The fruit is firm and immature at this point and must ripen further to allow harsh tannins to mellow and sweetness to develop. 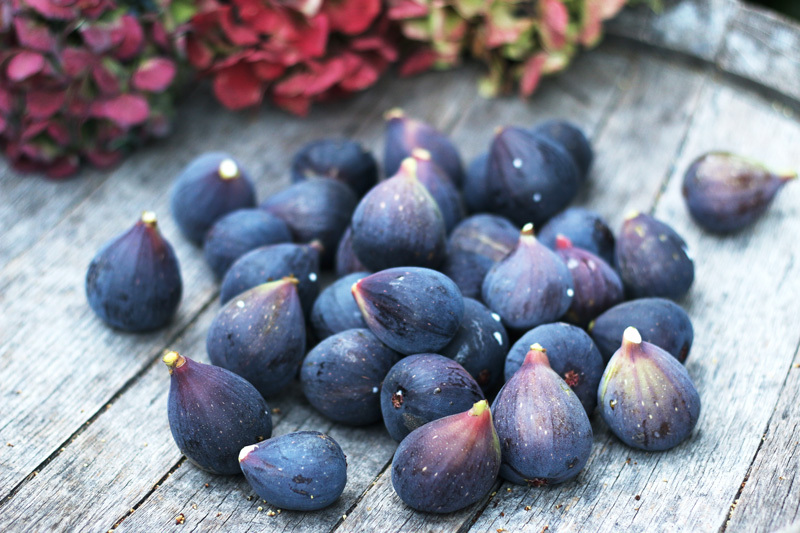 Take them home and place on your counter or window sill and watch the change that occurs as they mature. I fill an antique wooden bowl with vibrant orange persimmons and use as a cheerful decorative item in my home while they ripen. As they ripen, persimmons slowly soften and become darker in color until finally—after two to four weeks—they are mature enough to eat or cook with. 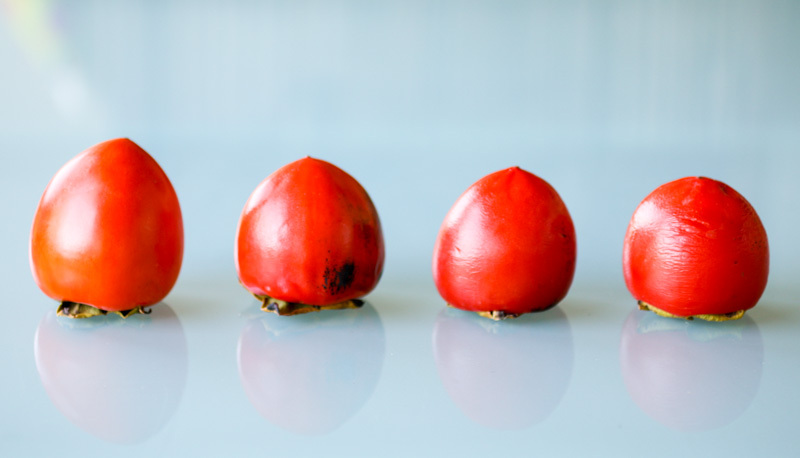 You can see the change happening in stages as they go from hard, yellow-orange pointed fruit to red-orange slouchy orbs with loose, wrinkled skin. 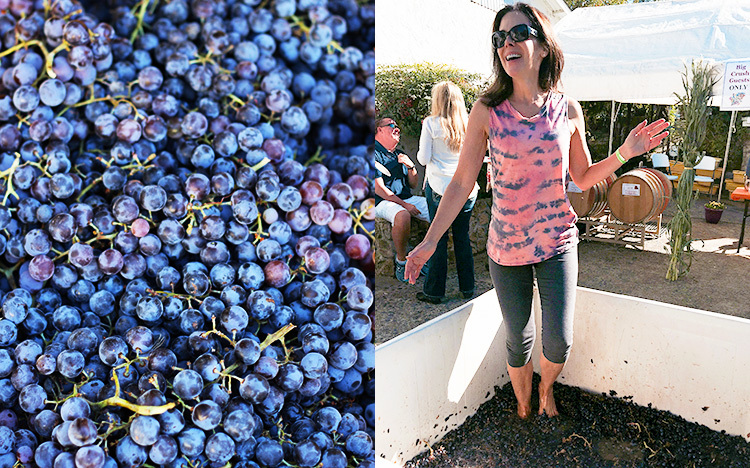 At the perfect point of ripeness, they look like water balloons—heavy, jiggly and ready to burst. Don’t be tempted to eat them before this time or you’ll experience a very unpleasant astringent aftertaste in your mouth. To speed up the ripening process, some people freeze partially ripe persimmons for 24 hours then thaw before cooking. In a pinch, this can help soften the fruit and reduce tannins, but they won’t be as sweet or mellow as naturally ripened persimmons. Be patient with persimmons and you will be rewarded! Food memories are precious things and I still recall the first time I tasted a persimmon. It was at Torre di Pisa restaurant in Milan, where I was dining with my then-boyfriend in the dead of winter. “I took the liberty of ordering you dessert since they have a very special fruit that is only available for a very short time”, said Maurizio as the waiter slid a plate in front of me. Expecting to see colorful tropical fruit, I looked down to find a wrinkly, burnt-orange blob on my plate that looked less than appealing. Slightly puzzled I asked, “What do I do with it?” Maurizio laughed, “Make a cross cut in the center and open it like a flower, then eat the inside with a spoon…like pudding.” I followed instructions and slid my knife through the paper-thin skin then repeated the motion crosswise. The persimmon fell open like four petals in a sensual display of glistening, jelly-like pulp that beckoned a taste. I dipped my spoon in and scooped some out. It was shiny and syrupy—more like soft jelly than raw fruit—and very much what in Italy we call dolci da cucchiaio or spoon desserts like creme caramel and panna cotta. When I lifted the spoon to my mouth, a delicate floral scent filled my senses like fine perfume. The taste in my mouth was…well, luscious. Silky and sweet with a hypnotic exotic fruit flavor and lingering vanilla finish. I was mesmerized and fell in love immediately (with the persimmon, not with Maurizio). Over the years, I continued my love affair with persimmons and searched them out each winter at my neighborhood fruttivendoli in Milan. But it was only after moving to California—and once I was teaching Italian cooking and developing my own recipes—that I became intrigued with the idea of a persimmon bread. I began experimenting to get the right balance of sweetness, wet to dry ingredients, and leavening to make a moist yet light fruit bread that showcased persimmon’s delicate flavor and fragrance. The decision to add pecans, with their subtle buttery nuttiness, was the natural choice to quietly complement persimmon’s ethereal qualities without overpowering them. 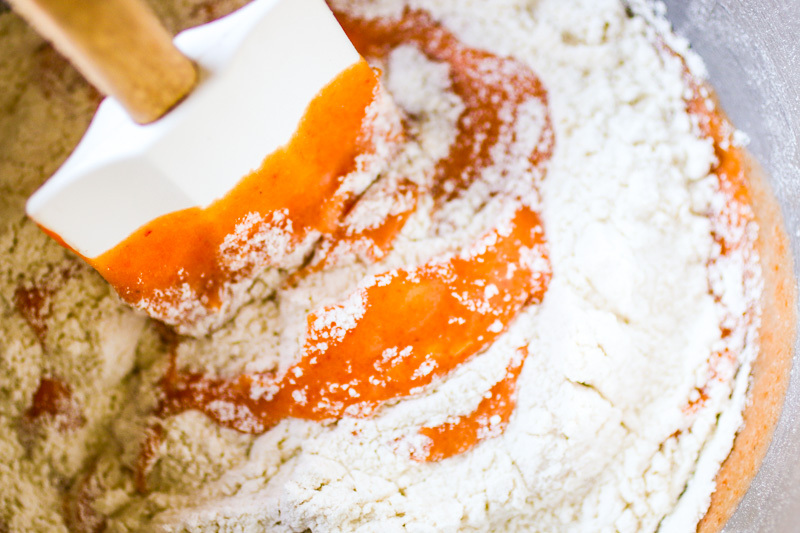 The batter for Persimmon and Pecan Bread is simple and easy to prepare. 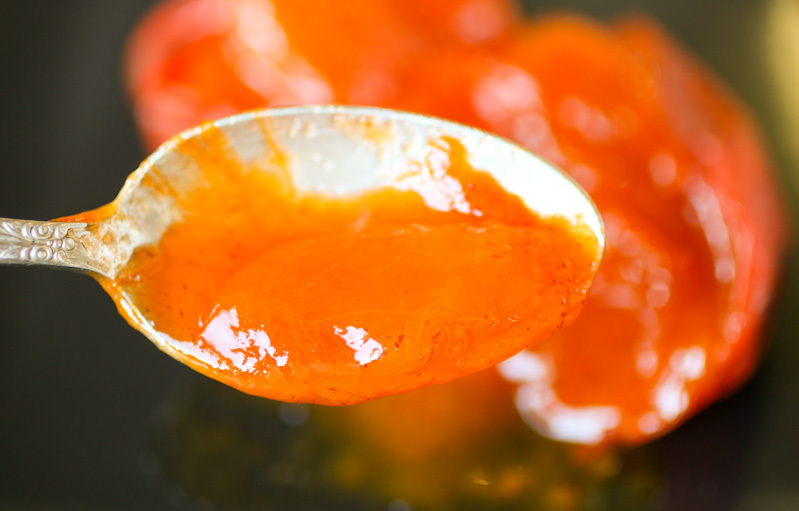 Cut open ripe persimmons and scoop out the pudding-like pulp then strain it through a sieve so it’s silky smooth and free of unwanted seeds or fibers. 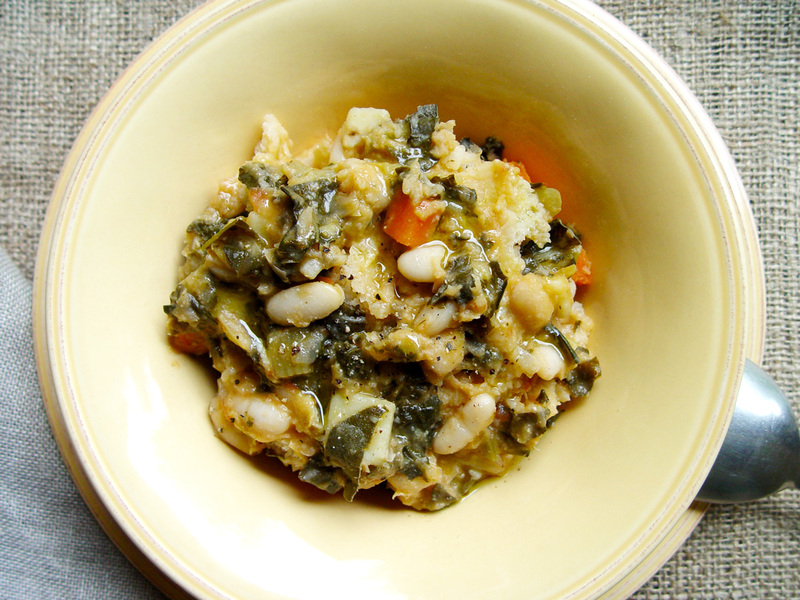 Measure out the amount that you need for the recipe but don’t waste any leftover puree! Persimmon puree freezes well and keeps for up to 6 months. 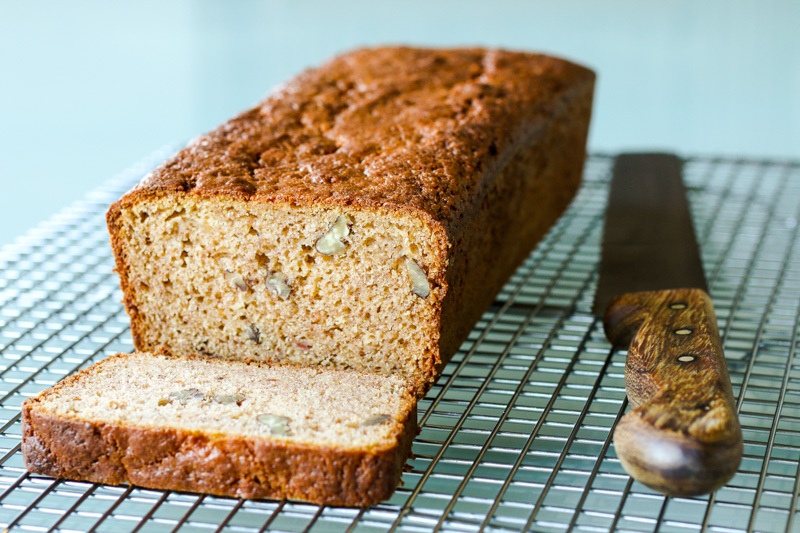 Just thaw and use like fresh to make persimmon and pecan bread well into the spring. 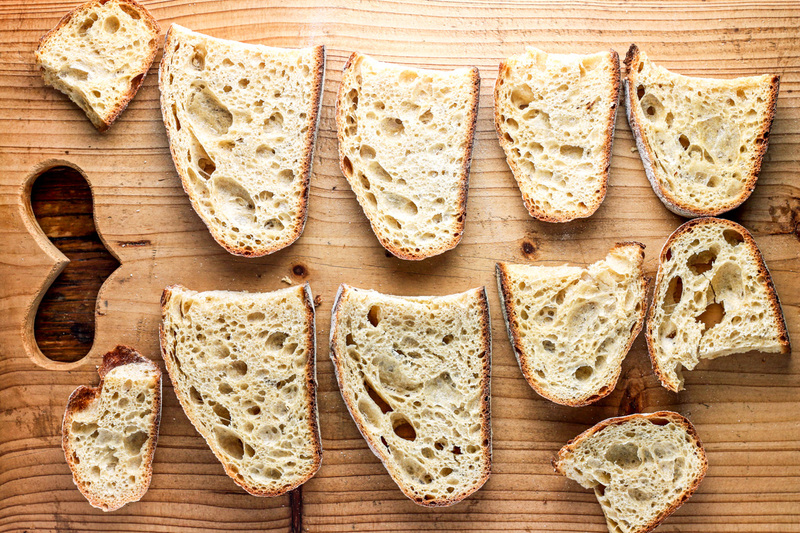 The secret to a light, airy bread is to mix the dry ingredients together first then add them to the wet ingredients with a few quick folding motions until just combined. 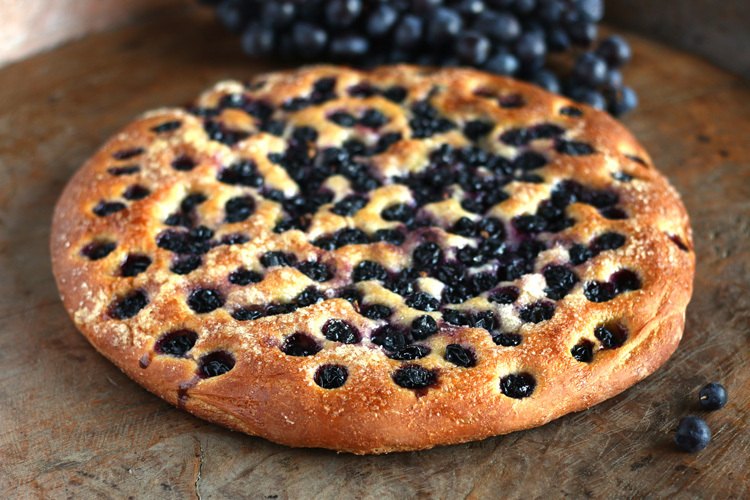 Don’t overwork the batter or the baked bread will be heavy and rubbery. Then, stir in the toasted pecans and pour the thick batter into a loaf pan. Bake until you can smell a sweet, flowery fragrance wafting out of your oven and the bread is golden orangey-brown on top and set in the center. Some things are well worth waiting for and perfectly ripened Hachiya persimmons are one of those. Now, I look forward to winter just to patiently watch these gorgeous persimmons ripen to perfection so I can enjoy this Persimmon and Pecan Bread. I hope you will too! 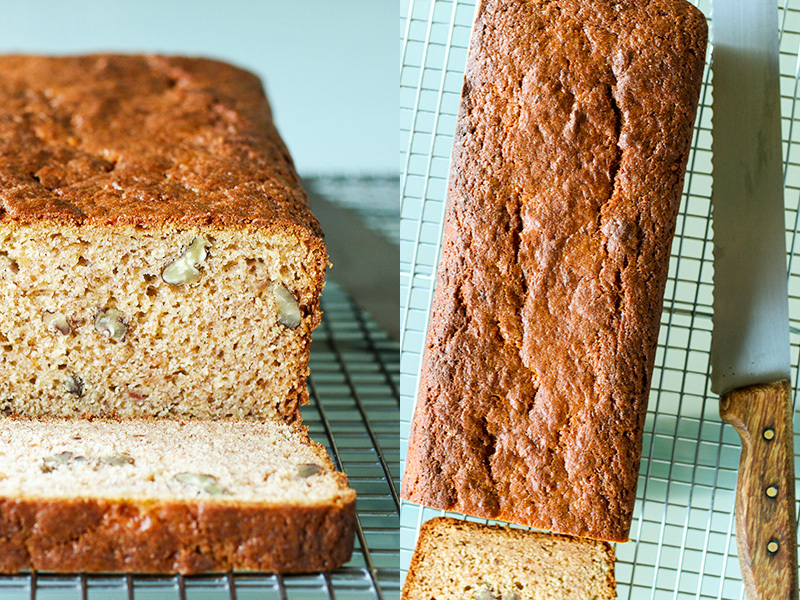 This persimmon and pecan bread has a delicate, exotic sweetness and fragrance that is a pure joy during grey winter months. Use Hachiya persimmons that are fully ripened and super soft like squishy water balloons to ensure that the pulp inside is sweet and astringent tannins have mellowed. © 2017 Deborah Dal Fovo. All rights reserved. Preheat oven to 325°F/165°C and place oven rack in the middle position. Butter and flour the inside of a 9-inch/23cm loaf pan. Spread the pecans in a single layer on a baking sheet and place in hot oven for 5 to 7 minutes or until lightly toasted. 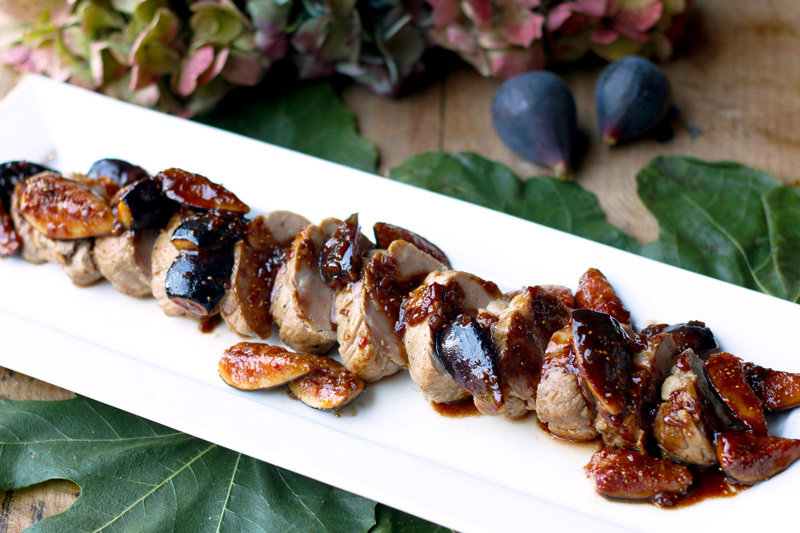 Remove from oven and cool completely then run a knife through the nuts once or twice to chop coarsely. Place the persimmons stem side down on a cutting board and make a cross cut in the center of each down to the stem. Open the fruit like a flower and scoop out the pulp with a spoon, scraping it off the skin and eliminating any black seeds and white fibers. 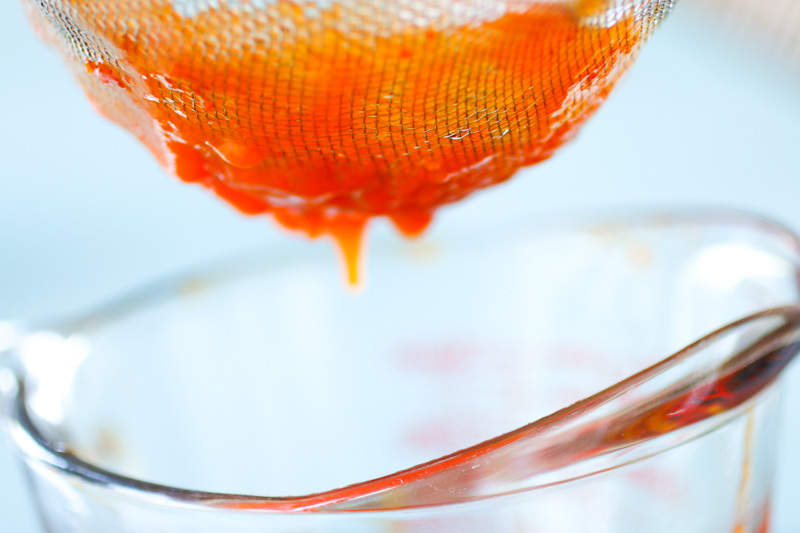 Transfer the persimmon pulp to a mesh sieve set over a bowl then press it through the sieve with the back of a spoon. Scrape bottom of the sieve to capture all strained pulp and measure to obtain about 1 cup. Alternately, you can puree the pulp until smooth in a food processor. Excess persimmon puree can be frozen for future use. 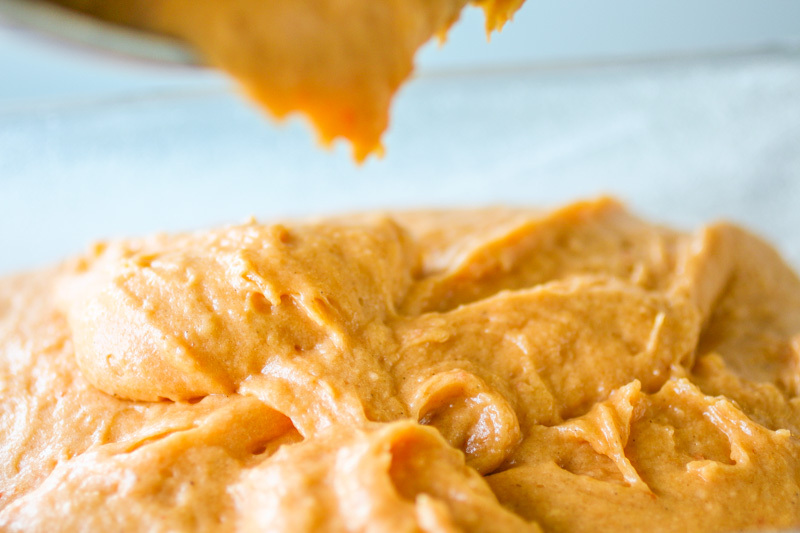 In a medium bowl whisk together flour, sugar, baking powder, baking soda, salt, and cinnamon. Place the melted butter, eggs and vanilla in a large mixing bowl and beat with an electric mixer until creamy. 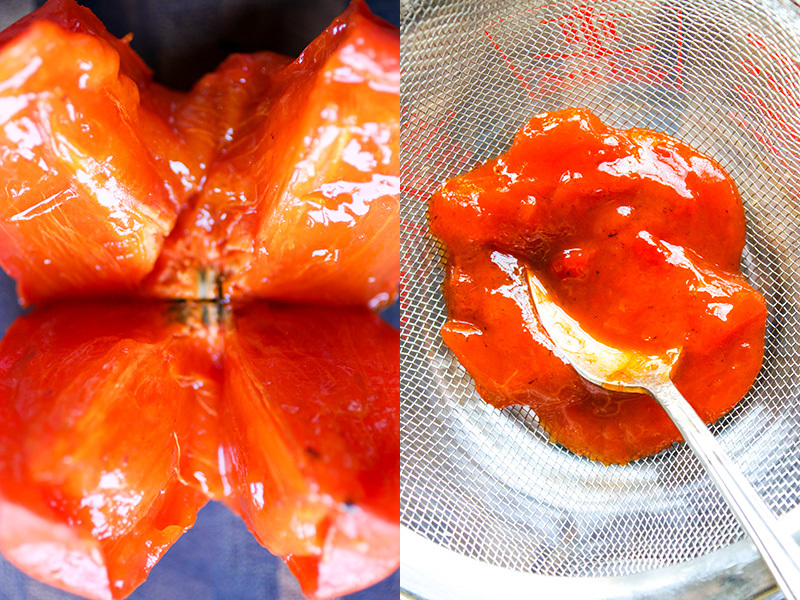 Add the persimmon pulp and mix until well combined. 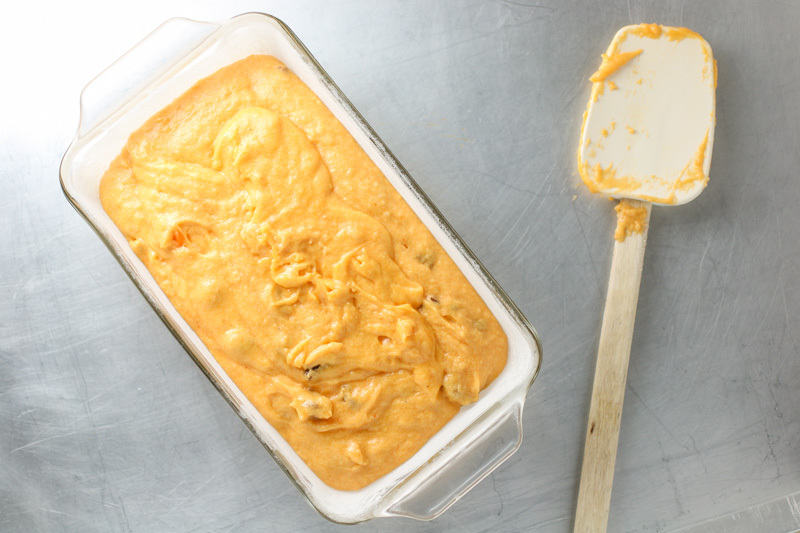 Using a spatula, fold the dry ingredients into wet ingredients until just combined and batter is smooth. Do not over mix the batter or the bread will have a rubbery consistency. Add the pecans and fold in until well distributed. Pour batter into the prepared pan then bake until golden brown and a toothpick inserted in the center comes out clean, about 55 to 60 minutes. If the bread browns too quickly before the inside is cooked, place an aluminum foil sheet over top to prevent burning. Remove from oven and place on a wire rack to cool for 10 minutes then remove bread from pan and cool. 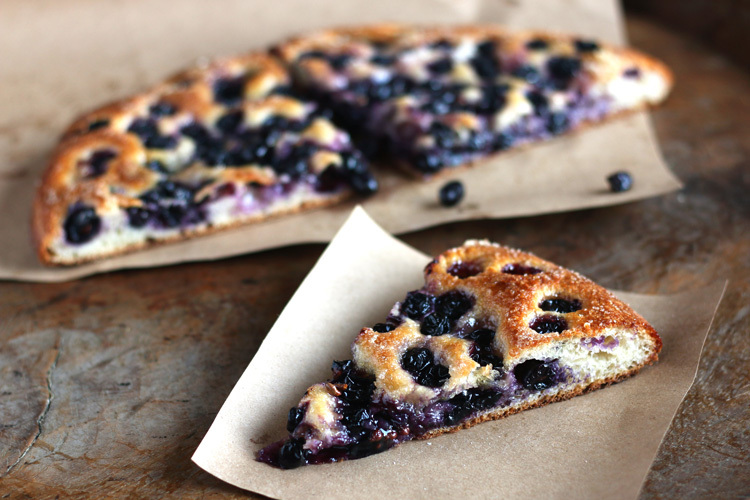 Serve bread warm or at room temperature cut into thin or thick slices. Note: Persimmon bread can be stored, tightly wrapped. at room temperature for about a week and freezes well. Most Italians would agree with me when I say that it wouldn’t be Christmas without Panettone. This golden dome-shaped sweet bread studded with raisins, candied orange peel and citron, that traditionally makes its appearance for Christmas and New Year, is a must to celebrate the holidays in Italy. You see them everywhere from artisan bakery windows to specialty stores and supermarkets, wrapped in colorful, decorative boxes that make them look like Christmas gifts perfect to bestow on family and friends for the holidays. In Italy, we often find ourselves with too many panettoni and don’t quite know what to do with them. 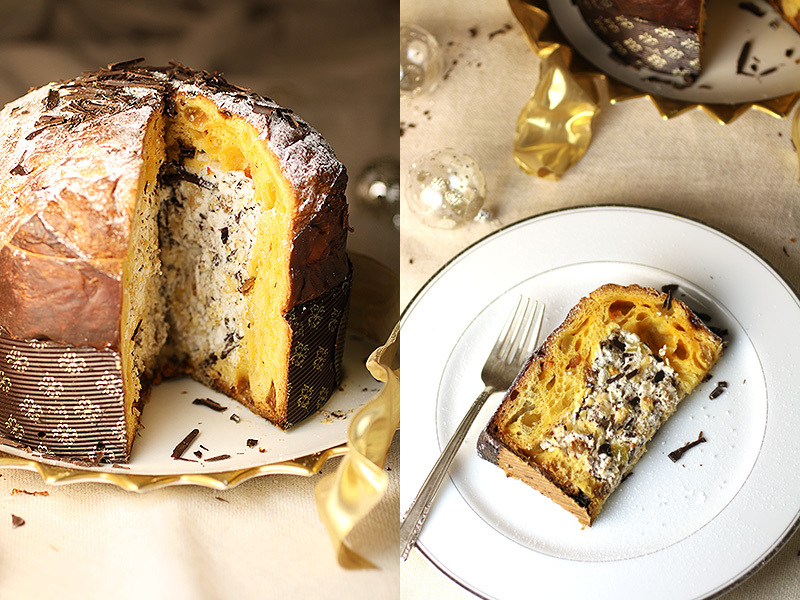 I created this recipe for Panettone filled with Whipped Cream, Chocolate and Hazelnuts as a way to dress up the cake-like bread and make it even more festive. Wrapped with a shiny ribbon and sliced at the table to reveal the surprise filling inside, it makes an elegant and joyous dessert for holiday dinners. 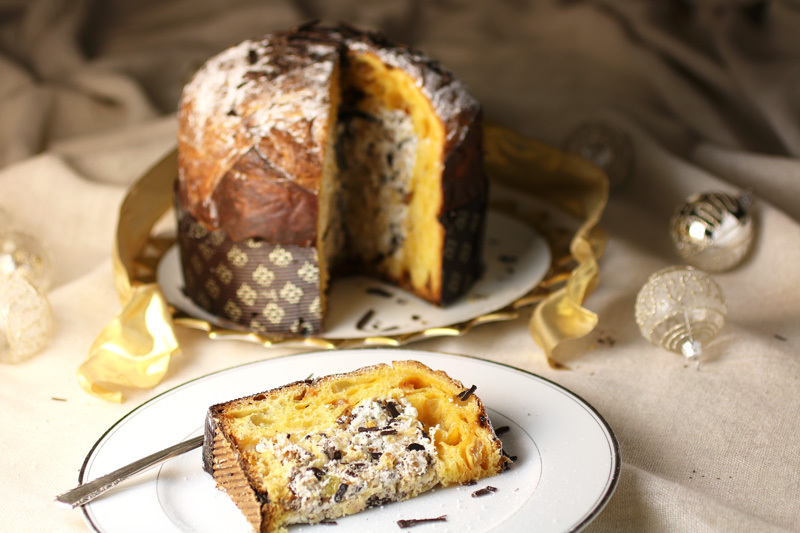 Panettone is a sweet, yeasted bread whose elaboration is considered a true accomplishment in the pastry world. 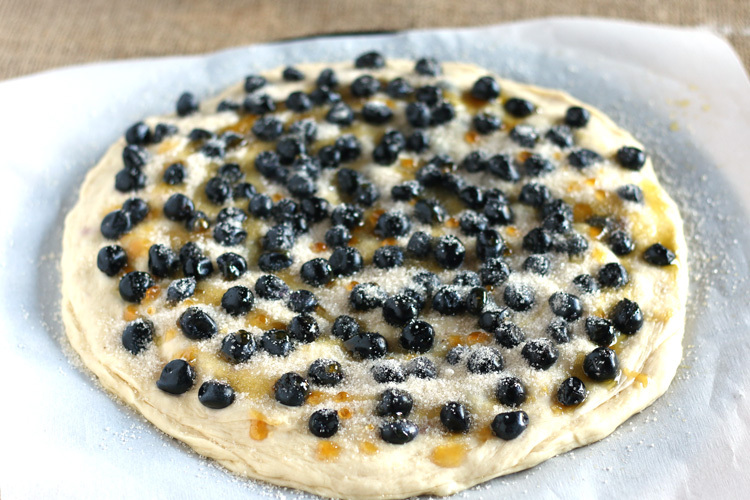 Its rich, buttery dough somehow defies gravity as it rises three times in thirty-plus hours to form a light and airy texture scented by the sweet raisins and candied citrus fruits that dot its ethereal crumb. 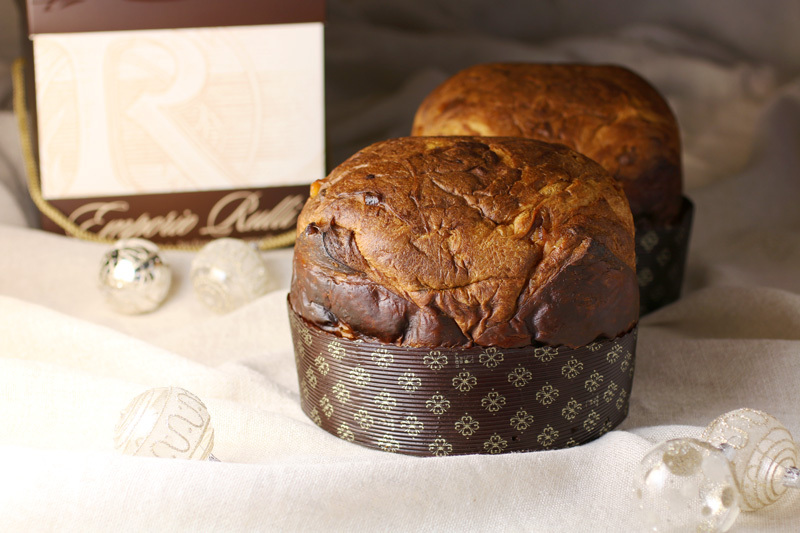 Baked in a decorative paper mold until deep burnished brown then hung upside down to maintain its distinctive rounded dome shape and impressive height, panettone is a holiday ritual and symbol of celebration in Italy. Invented in 15th century Milan, its legend has a few different versions and all of them reflect the labor of love that panettone is to prepare. The classic version containing raisins, candied orange peel, and citron is the original Panettone Milanese, and an obligatory slice is enjoyed as is or embellished with a dollop of mascarpone cream, crema di mascarpone, as a traditional holiday dessert or snack. While there are many commercial brands available, the best panettoni are made by the specialty bakeries of Milan. 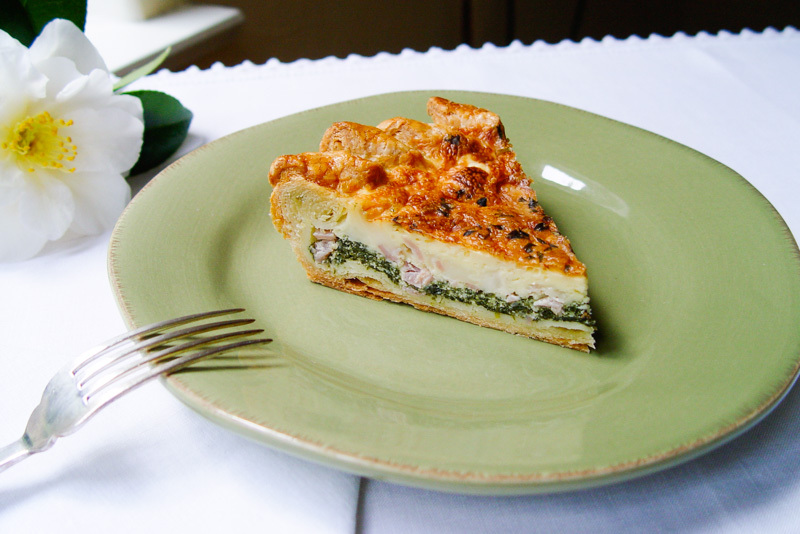 Since I’m not in Milan this Christmas, I enlisted the help of my Italian baker friend Gary Rulli for this post. Gary kindly offered me the authentic artisan panettoni Milanesi he makes at his Italian caffe’ and bakery, Emporio Rulli in Larkspur, California to use for my dessert. While this dessert is seemingly complex, it actually takes very little time and effort since the panettone is store bought. And that’s a very good thing during the holidays when time is precious. The first step to making it is to slice the dome top off the panettone and hollow out the cylindrical bread loaf to make room for the filling. I cut a circular shape in the panettone, leaving a sturdy bread border around the edges and along the bottom, then pull out the center crumb with my fingers to create the empty cavity where the filling will go. To add even more lovely citrus flavor to the dessert, I sprinkle the extracted crumb with Grand Marnier orange liqueur and let it soak in while the other ingredients for the filling are prepared. First, I toast hazelnuts in the oven and tuck them into a kitchen towel to steam before rubbing vigorously in the cloth to remove bitter skins before chopping. Then, I shave a dark chocolate bar (70% cacao preferred) into shards using the blade of my chef’s knife. Here, I also chopped some homemade candied orange peel into tiny dice to add more citrus flavor. Lastly, heavy cream is lightly sweetened with confectioners sugar and whipped until thick and billowy before the chopped ingredients and liqueur baptized panettone pieces are carefully folded in. The filling is spooned into the empty hollow of the panettone and its dome bread lid placed on top before it goes into the refrigerator to set for a couple of hours. And that’s it! Dessert is made with plenty of time to spare for last minute shopping or gift wrapping. Before serving the panettone, I dust the top with a generous snowfall of powdered sugar and garnish with extra chocolate curls shaved from the bar. Then I tie a beautiful gold ribbon around the bread and serve it on a gilt platter. At the table (once the oohs and aahs have subsided), I remove the ribbon and cut the panettone into wedge-shaped slices, complete with decorative paper border, and serve it with glasses of chilled Moscato d’Asti. My Panettone filled with Whipped Cream, Chocolate and Hazelnuts is a festive, delicious and, above all, easy to prepare dessert that makes holiday entertaining effortless and enjoyable. Buon Natale e Felice Anno Nuovo a tutti! Merry Christmas and Happy New Year to all! Traditional Italian Christmas sweet bread is made even more festive with a filling of whipped cream, chocolate shavings, chopped hazelnuts and candied orange peel. © 2016 Deborah Dal Fovo. All rights reserved. Preheat oven to 350°F/180C°. 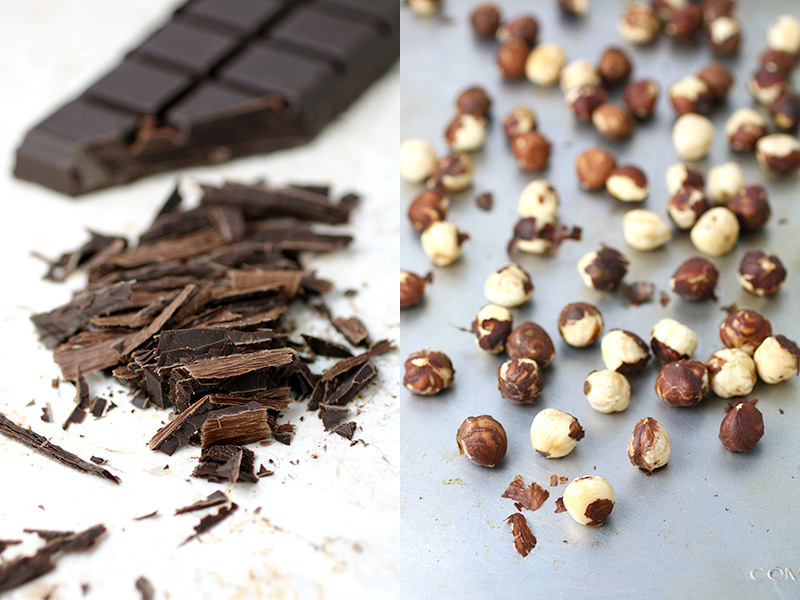 Spread the hazelnuts on a baking sheet and place in center of hot oven for 5 to 7 minutes, shaking the pan occasionally. Remove from oven then place the hot nuts in the center of a clean kitchen towel. Gather the edges of the towel together to form a pouch then let the nuts steam and cool for 5 minutes. Pick up the pouch by the gathered towel ends and rub the hazelnuts against each other in the towel with your other hand to remove papery skins. Chop the nuts roughly and set aside. 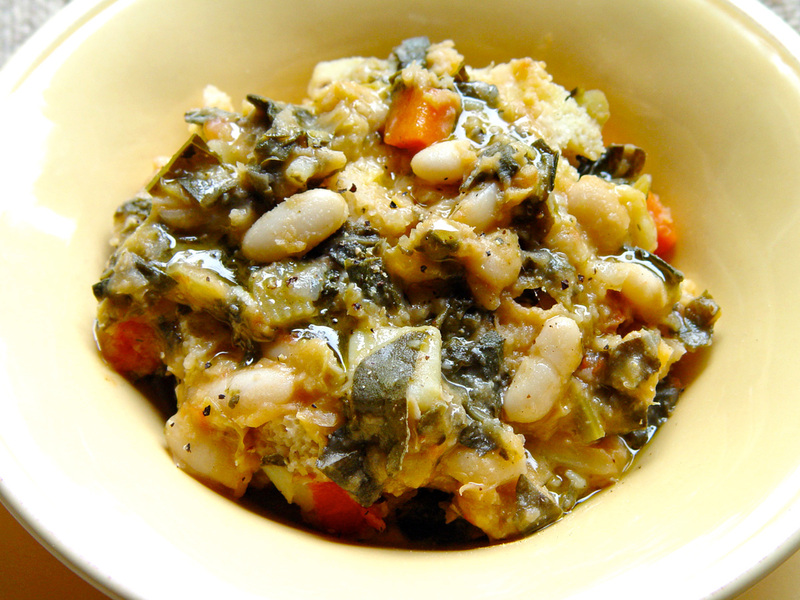 (If using almonds just toast and chop without removing skins). Cut the rounded dome top off the panettone in one clean horizontal slice about 1-1/4 inches in thickness, and set aside. Using a long, thin knife held vertically, cut out the center of the panettone leaving a 1-inch border around sides and a 1½ inches on the bottom, without perforating the bottom or sides of the bread. 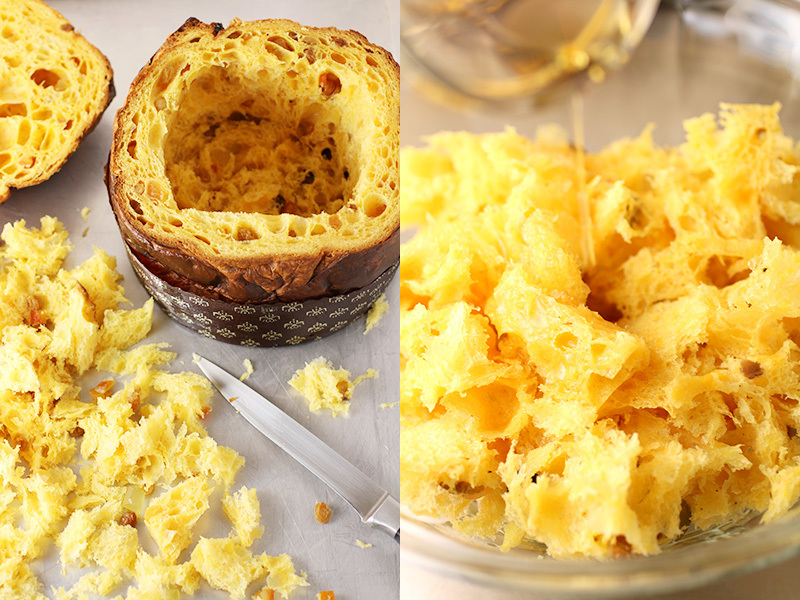 Hollow out the bread crumb from the center of the panettone then tear it into pieces and place in a bowl. Sprinkle the panettone crumb pieces with Grand Marnier and toss to coat. Using an electric mixer, whip the cream until thickened. Add the confectioners sugar and beat for another minute until light and fluffy but not dry. 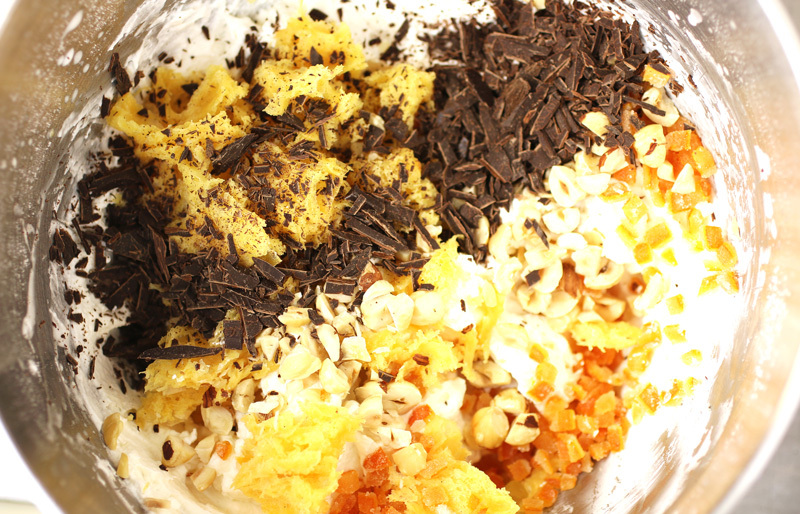 Fold the torn panettone pieces, chocolate, hazelnuts, and candied orange peel (if using) into the whipped cream. Fill the hollow of the panettone with the whipped cream mixture, pressing down slightly. 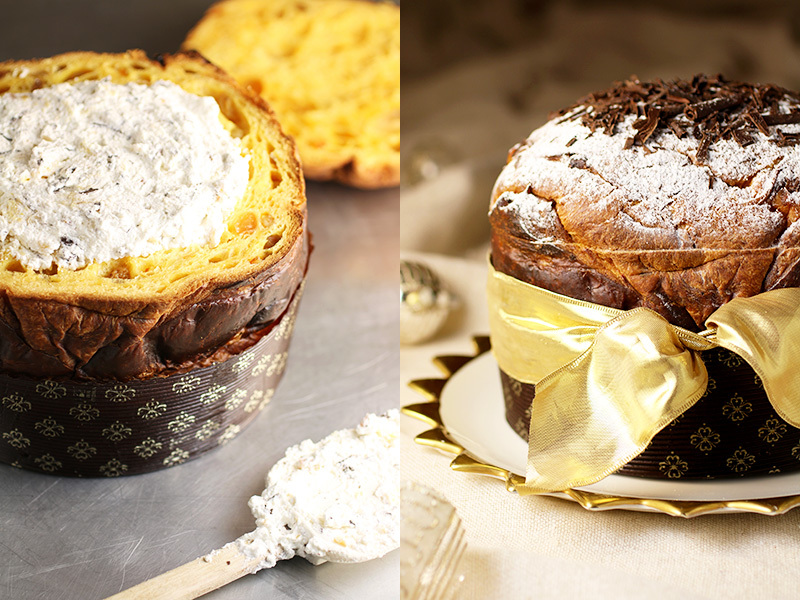 Replace the bread dome top on the panettone and refrigerate for 2 to 3 hours. 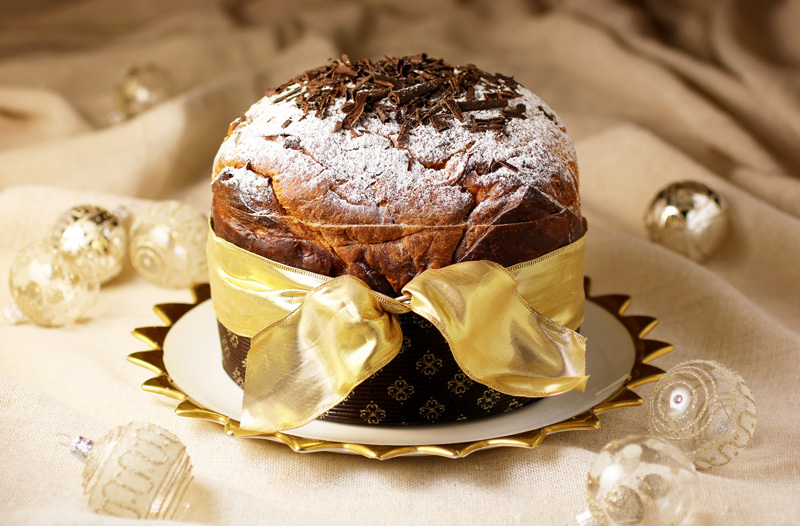 Before serving, dust the top of the panettone with powdered sugar and decorate with chocolate shavings. Place on a round platter and wrap with a festive ribbon if desired. Serve cut into wedges using a serrated knife, taking care to cut through the paper wrapped base cleanly so each slice has a decorative border. 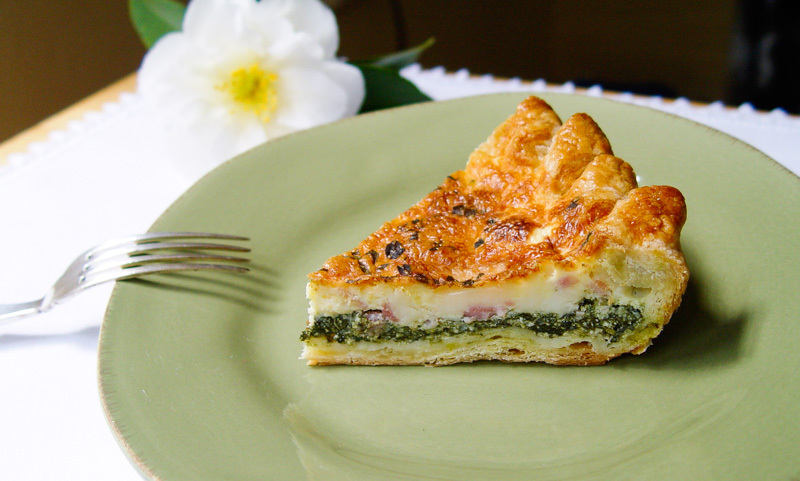 Serve on individual dessert plates accompanied by a glass of moscato d'Asti or other dessert wine or liqueur. 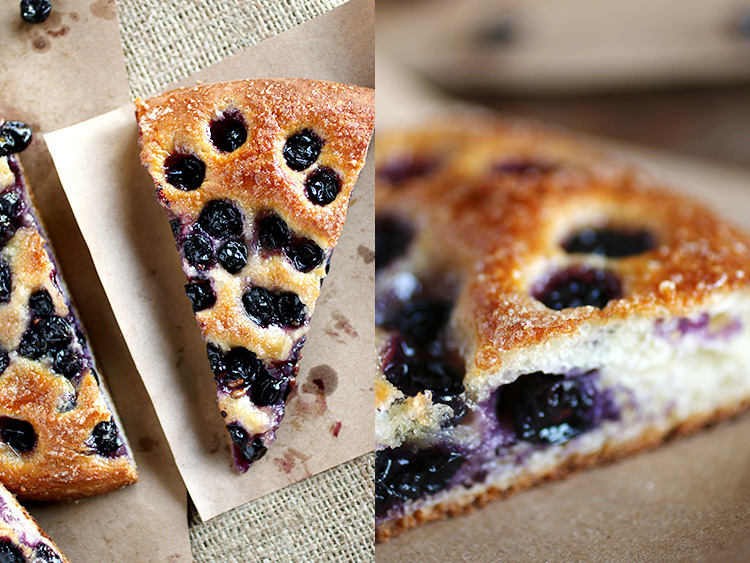 Schiacciata con l’uva is a sweet focaccia filled with grapes whose anual appearance in bakery windows signals the joyous start to Tuscany’s autumn wine harvest. It’s a simple treat made from layers of bread dough stuffed and topped with juicy wine grapes and sugar that, when baked, become a jammy filling with the surprise crunch of grape seeds. © 2016 Deborah Dal Fovo. All rights reserved.